This creamy, flavorful soup is so easy to make I love it for a quick, cozy weeknight dinner. It keeps well and the flavors improve the next day so its great for meal prep too. Paired with a piece of fresh crusty bread, it’s the ultimate vegan comfort food. In a large soup pot, cook the onions in the olive oil over medium heat for about 5 minutes, stirring often. To make it oil-free, you can cook the onions in 2 tbsp of water or broth. Add more as needed if the pan starts to dry out. Add the vegetable broth and chopped broccoli. Bring to a simmer over medium heat and cook for about 15 minutes, or until broccoli is tender. 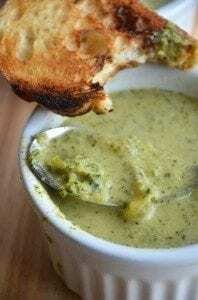 Either scoop all the soup into a blender and blend to your desired consistency or for chunky broccoli soup, remove about 1/2 of the soup and puree, leaving the rest behind. You can also use an immersion blender right in the pot if you like. Pour the blended soup back into the pot. If it’s too thick for your liking, stir in some extra broth or unsweetened almond milk to adjust the consistency. I updated this recipe in February of 2019. The original recipe called for half unsweetened almond milk and half broth for the liquid but I decided to change it to all broth. You can try it with half and half if you like, both ways are good. You can also just stir in a little plant milk at the end for some extra creaminess.